HousingPANIC was one of the first champions of Ron Paul. I think that's undisputed. He was talking about our economic issues when nobody else was. His stance on women's rights was wrong, but we were willing to overlook that because he was so right on everything else. He then caught fire on the internet, raised millions, debated well, but then gave up too soon. And now, he's endorsed the unknown religious nutcase pastor candidate from the nutcase crazy far right wing party who thank heaven will get less then 1/10th of 1% of the vote. And a candidate who is FRIGHTENINGLY wrong on the issues, and 100% AGAINST the Constitution, even though his party is hilariously and Orwellianly named the "Constitution Party"
Ron Paul has let us down. Bigtime. Ron Paul, as far as I'm concerned, is no longer deserving of our support. Ever again. And I think what this goes to show is - NEVER, EVER TRUST A REPUBLICAN. THEY'RE LIARS. AND EVEN THE "GOOD ONES" HAVE HIDDEN AGENDAS THAT SHOULD SCARE YOU. Here's what the nutcase from the far right wing Constitution Party believes, in case you're keeping score at home. Which is truly sad, because a party named after the most beautiful document ever written should read it once and awhile. The Constitution Party HATES the US Constitution. So I HATE the Constitution Party. And I now HATE Ron Paul. no “foreign entity” should be allowed to own any U.S. assets, including real estate, stocks, bonds, or Treasury notes. I'm letting it slide because Ron is a much needed ally. Use him, don't be used by him. WTF? protect freedom of speech by limiting some types of speech? I guess I am just not smart enough to understand the logic behind that. This was done more out of dislike for Barr than for like of Baldwin. You are making entirely too much of this. I think you missed the point - it sounded like Ron was pissed off that Barr told him to follow the party line (and blew him off when he wouldn't), so instead he thumbed his nose at the Libertarians and endorsed the Consitution Party. What would you have thought if he had fell in line like the other politicians? He's still ok in my book. I think he is just following through on his real endorsement for 2008 which was for all third party candidates when he made that announcement earlier this month. Him supporting the Constitution party now is consistent to what he has always been saying to his supporters throughout the campaign which was basically "make your own choice" and don't let the establishment fool you into thinking that they can make better choices than you by forcing the two-party system. To me there is Ron Paul the individual, and the movement that Ron Paul sparked. Don't know what to make of all this. I personally cannot comprehend how the 'Constitution Party' allows such bigoted candidates. Might as well call it the 'Contradiction Party'. 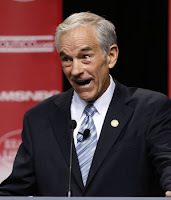 As for Ron Paul - maybe he's just showing how idiotic the entire political system is. I think the Libertarians just killed their party with Barr. Oh well...we're all screwed over anyways. Oh yeah, Ron Paul is such a bad bad man. How will you point out politicians flip-flopping, even in the face of new facts, without coming across as a hypocrite?